How do I clean my Razer controller? We cannot say with certainty what type of dirt and debris may be on your product, or how certain cleaning products may react with it, but we have had good luck cleaning Razer products using commonly available monitor cleaning wipes. To clean the body of your Razer controller please take a monitor wipe and use gentle wiping motions. Do not scrub the surface of your Razer controller. Can I use my Razer Sabertooth on the PC? Absolutely! Your Razer Sabertooth is fully PC compatible without the need for any drivers. We haven’t forgotten all the PC gamers who desperately need a phenomenal controller to step up their game. My Razer Sabertooth is not recognized when I plug it into my PC. Windows should have the default driver installed on your computer. Otherwise, please follow the link below and install the driver from Microsoft. 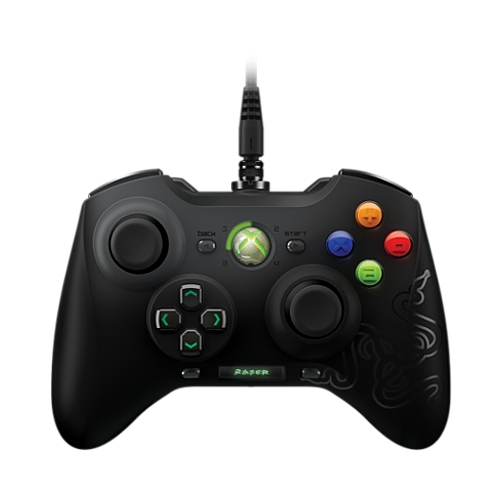 Will the Microsoft Chat Pad work with the Razer Sabertooth? No, the ergonomic form of the Razer Sabertooth does not fit the chat pad. Microphones with standard 2.5mm jacks are compatible. Will there be a wireless version? There is no plans for a wireless version at the moment as it is designed specifically for eSports and requires a stable connection and minimal latency for competitive gaming. Does the Razer Sabertooth support microphones that connect to the controller? The Razer Sabertooth has a standard 2.5mm microphone jack. Any microphone with a 2.5mm connectivity can connect. For optimal gameplay experience, we recommend using the new Razer Chimaera 5.1 Wireless Headset for Xbox® 360. Unfortunately, customer support has no information on future product or driver releases. For any information regarding future products please visit our website ,our social media outlets, or the Razer Insider Forum here.